The HS library welcomes everyone in the larger JFK community: students, staff, parents, alumni! 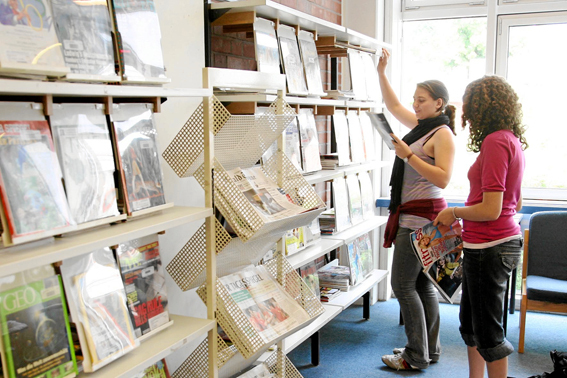 The JFK School Library has been serving students, faculty and families of our unique school community since 1962. For some members, the library represents the only readily accessible English language resource center and an integral part of their community away from home. Setting up an account only takes a few minutes. Please feel welcome to come in any time during our regular hours. Our subscription databases are located on the home tab of the online catalog. See the librarian for passwords! Choose from over 46,000 English and German books to borrow. We also offer materials in other formats, including e-books, audio books , DVDs, magazines and newspapers; AP, SAT & ACT prep materials, university information and application essay guides. See our web links on the catalog home tab for more German and English digital resources. We have wireless Internet access as well as computer stations, a scanner and printer for students and teachers.